It took a while of studying, and a HamCram at the end, but I got my Extra class ticket this afternoon with W6SF Stockton Delta Amateur Radio Club. I missed one out of the 50-question exam. I highly recommend taking your amateur license exam with SDARC. They don’t follow all those outdated 1980’s ways of doing ham things (i.e. physically mailing a big stack of paper to the VEC), but file with the VEC/FCC electronically. The VE assures me I’ll see the FCC database update in 3 days; instead of weeks with other examiners. This is the last level of amateur radio licensing. Now I have no excuses… I need to just focus on actual radio practice and experimenting with all the different things that have opened up at this level. 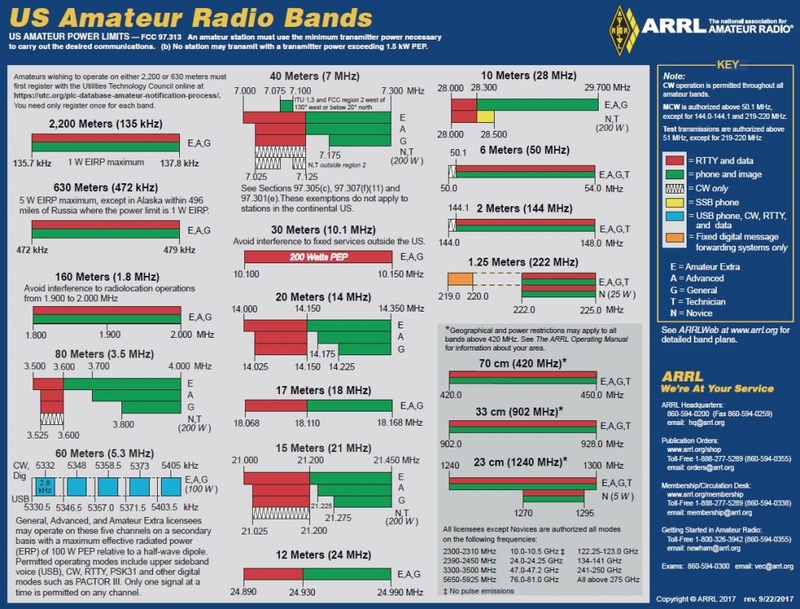 I will have the ARRL Band Plan on hand at all times till I memorize it, and can now pretty much transmit on all available FCC amateur bands without worrying if I’m in the wrong operator allocation. N6KZW Paul was there, not in a VE role, but helping out. He asked me, “What are you going to do in ham radio?” I said, “Just get out there and reach people.” I actually don’t know what I want to do next… There’s still so much to learn, and to even get working (e.g. my HF antenna mounting, digital, learn CW…). What will I do in ham radio? My problem is I want to do it all, with never the time or finances to follow each path in depth. This constraint drives selectiveness and getting creative. This was a huge rush for me, and I’d personally like to thank W6SXA Mark for study tips earlier this month; NZ6Q John for leading the HamCram and the Club (he’s got ideas and is moving the whole ham community! ); K6AAN Mike for being a VE and reigniting some interest in homebrew DMR repeaters, N6KZW Paul for always being a warm helpful jokester, N6TCE Bob and N6ZDH Dan for doing a bunch of legwork and setup for the exam. Now to get on the air. Passed the General License exam this morning in Granite Bay, California. Not that you can’t find my address, but I remove it out of habit. I’d been studying for about a month. But last night I thought to cram for it since there was an available exam going on in the morning about 50 miles north of me. I went through the whole General Exam question pool. I was unsure of so many answers, and not even halfway through all questions, that I thought, “I’m never going to pass this thing.” There’s a bit of math and frequency allocation memorization needed, as well as understanding schematic diagrams and figuring out ohms, picofarads, and millihenries. But I did power through the studying, referring often back to the reference material. For those interested in studying for any class license, I totally recommend the ARRL series of License Manuals. It’s probably the best way to prep for the exam. Anyhow, waking too early for a Saturday, I got to the exam location by 8:30am and was greeted by WA6FGI Gary, an Amateur Extra VEC examiner. I showed them an official copy of my FCC Technician license and my ID, and got signed in with forms to fill out. I was then given the multiple-choice answer sheet and a test. There were about 6-8 other people there also taking an exam, some totally new to ham radio, attempting to get their Tech. I heard one guy unfortunately not pass for General, and another person not pass, though I’m not sure for what class. Many others got congratulations and a hand-shake from the VEC examiners for getting their license (or upgrade). I got through the exam really quickly, only pausing for 2-3 questions that I was not certain of. When I was done, three Extra class hams looked over my answer sheet and transferred it between each other for triple review. After a few minutes, one of them called me over and congratulated me on passing the General. I thought about the prospect of that. Buoyed by the recent victory, I told them, “I studied absolutely nothing regarding the Extra license, but sure! I’ll give it a shot!” They seemed pleased that I would try. I overheard several others who had finished and successfully passed their Technician exams decline the chance to try for the next level. It was a longer test, 50 questions instead of 35 for the General, and significantly harder. I guessed a LOT on this one. After a good long while, I submitted the answer sheet, and several more minutes later, they told me I did not pass for the Extra level. Well, at least I got a taste of what the next exam will be like. Time to hit the next manual and learn! Nevertheless, I’m now an Authorized General class amateur radio operator. KF6UJS/AG. I am so thrilled! HF here I come! Great California Shake-Out Earthquake Drill! It was a quick checkin on the W6SF repeater from Folsom, CA today. In participation with The 2017 International ShakeOut Day, today Oct. 19, 2017 at 10:19am, we had a QST to check in to the drill. Most checkins had “no damage” but there could have been mock damage appended with “this is a drill” at the end of the transmission. Hitting the 147.165+ repeater (located by Fiddletown, CA some 30 miles away) from Folsom was difficult on my 5 maximum watts with mobile-mount antenna in a business parking lot. My radio tests 10 minutes before the drill got reports back of “no copy” with lots of noise, low audio. I had to drive around a bit to find a higher vantage point to hit the Sierras on my limited QRP. The whole drill was quick, lasting only about 7 minutes. It was great to participate. This exercise got me to thinking about what I need for a truly portable EMCOMM rig. A simple mag-mount fixed antenna, and especially with low watt HT (without charger, no less! ), is hardly sufficient for the pockets of the valley. I might need to look into a dedicated portable mobile rig that can bump up the tx power, and an antenna that I can raise (e.g. foldable that can deploy on a stand) for clearer more reliable communications. So if I were stuck at the office during a catastrophe, I think I’d have to resort to other closer repeaters to reach out– and miss out on my own club’s traffic until I could move to a different location. Stuff to think about and plan for.